… have trouble remembering tens or hundreds of online passwords? … write passwords down somewhere, even though you know this is not the safest thing to do? … use the same ("cleverly" modified) password in multiple places, instead of using properly randomized passwords that offer the best security? … sometimes wish you had a photo of a creditcard, passport or other document handy? … want to securely store lots of other confidential information, photos, animated GIFs, office documents, you name it? … want all this to be secure, but still very simple to use? Then "The Vault" is for you! = WHY IS IT BETTER ? – The Vault is very simple to use, yet it employs industry-standard encryption to keep your data safe. – The Vault can securely store photos and pictures; for example a scan of your passport, a photo of your credit card, or just the serial numbers of some equipment you own. Anything. – The Vault can securely store *any* office or other document. – The Vault can securely store – and play – animated GIFs. 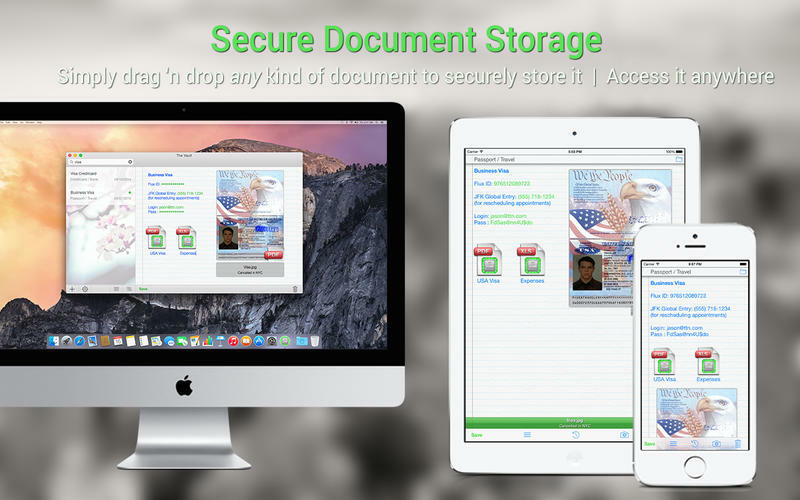 – Securely storing photos and documents is as easy as drag-and-dropping them on an open Note. – Securely synchronizes with The Vault for iOS !